Moroccan salads are funny, because to most people they aren’t really a salad at all. The first time I ate za’alook or taktouka I just assumed it was some sort of cooked vegetable side dish. The longer I stayed the more often I began to see different cooked vegetables and soon I learned these were in fact Moroccan salads. I’m sure there was some reasoning to it in the past, perhaps to use vegetables gone past their prime or cook out germs but I’ve never found any solid proof of this. Whatever the reason, it’s just the way things are today! Over the years I’ve learned to make dozens of different varieties of salads because there are so many! I’ve also learned which salads pair best with which tajine and those salads that I can make fast and which ones take more time to prepare. This salad however was completely new to me. M and I did a cooking class at Dar Les Cigognes in Marrakech and this was one of the salads we made. That was great because it was new to me, something I wasn’t sure they’d be able to pull off – but they did! 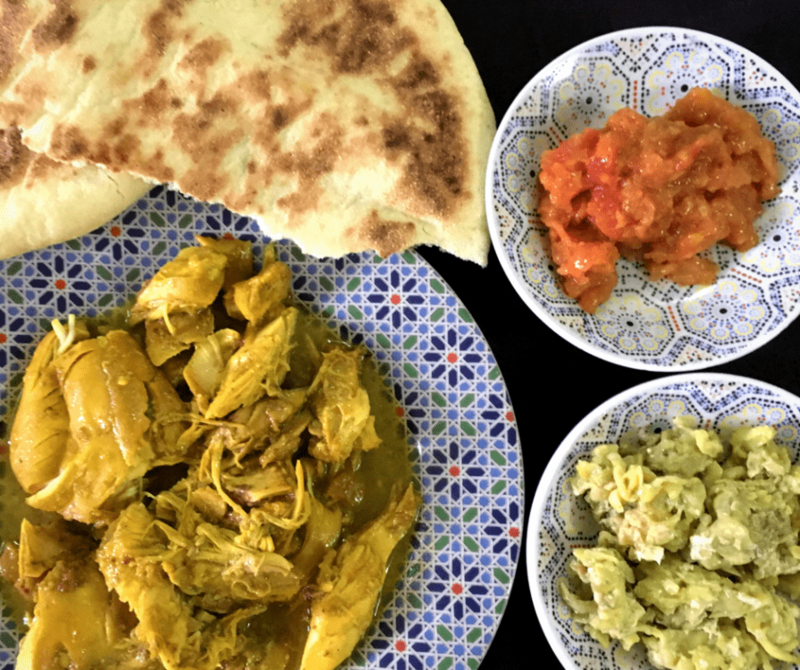 I coyly asked for the recipe and while recipe transmission in Morocco is from brain to fingers, I was able to jot down the basics and recreate this later. I’m still hesitant to call this a salad because frankly it’s just not. At best, I’d call this a tapenade or for those of us that are a little less fussy – a dip. It’s got a million different uses; eat it as is with some bread, throw it on top of some bbq chicken, add it to a buddha bowl, slather it on a piece of bread and top with goat cheese – you get the idea. Make it and you’ll understand what I mean! You're going to find a million uses for this salad! Blanche tomatoes to remove skin by boiling water in a pot large enough to submerge the tomatoes. Score each tomato lightly (breaking through the skin) and add to boiling water. Remove once the skin starts to peel away; approximately 2-3 minutes and immediately submerge tomatoes into ice water. Peel the skin from the tomatoes and discard. Cut the remaining tomato into chunks discarding any hard bits like stems or hard centers. In a large frying pan melt butter and oil on medium heat. Add tomato and reduce to low heat. Once tomatoes begin to soften add cinnamon and salt. 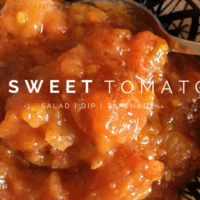 Continue cooking until tomatoes are completely soft and have a sticky texture. Remove from heat and eat at room temperature or cool and store in the refrigerator for up to 3 days. Oh, it’s like a chutney! 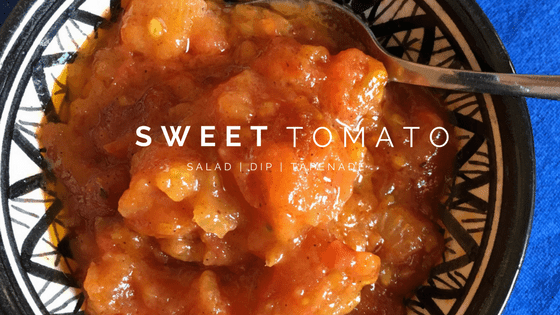 Sounds yummy and we have a ton of ripe tomatoes now in the US. Thanks! Yes a little bit but without any acid aside from the tomatoes.